This article was published in the December 2012 issue of The Bridge, a quarterly magazine published by the Malaysia Canada Business Council. In this article, Mr. Foong Cheng Leong briefly sets out the intellectual property rights protected in Malaysia. Foong Cheng Leong is an Advocate and Solicitor of the High Court of Malaya and also a registered Malaysian trade mark, industrial designs and patent agent. He is also the co-Chairman of the Kuala Lumpur Bar Information Technology Committee and a member of the Malaysian Bar Council Intellectual Property Committee. The recognition of intellectual property rights in Malaysia started as early as the 1800s during the Straits Settlement days. As the years go by, laws to protect intellectual property rights were expanded. Malaysian intellectual property laws are fairly similar with the laws of other Commonwealth countries and more or less in accordance with international practice. A trade mark is an important asset for all businesses. It consists of a device, brand, heading, label, ticket, name, signature, word, letter, numeral or any combination thereof. It provides their owners with the legal right to prevent others from using an identical or confusingly similar mark. In Malaysia, the laws that govern trade mark rights can be found under the Trade Marks Act 1976 and Trade Marks Regulations 1997. Trade mark proprietors can choose to protect their marks through the process of registration. This gives the registered proprietors exclusive right over the trade marks thus allowing them to take legal action against anyone who infringes their rights. The trade mark registration process is administered by the Intellectual Property Corporation of Malaysia (also known as MyIPO. Website at www.myipo.gov.my ). Prior to filing an application, an applicant is advised to conduct a search at the Trade Mark Register to determine whether there are any identical or similar trade marks that were filed. Such search would be useful to the applicant to determine whether to use or file their trade mark in Malaysia. Further, when deciding whether to register a mark in Malaysia, one must ensure that the mark is distinctive. A distinctive mark means a mark that is capable of distinguishing the goods or services of the proprietor from other traders. The registration process in Malaysia normally takes about 1 to 2 years. Upon registration, the proprietor will be issued a Certificate of Registration valid for ten (10) years and it is renewable every ten (10) years. Copyright protects various type of works such as literacy works which covers novel, lyrics, articles, computer program and so on; dramatic works such as dance choreography; artistic works such as paintings, photographs or any logos, drawings; musical works; recordings; broadcasts and finally, layouts. However, it does not cover procedures, methods of operation or mathematical concepts as such. The law regarding copyright protection in Malaysia can be found under the Copyright Act 1987. Effective from 1 June 2012, it is possible to make a notification of copyright under the Copyright Act 1987 and Copyright (Voluntary Notification) Regulations 2012 with MyIPO. A notification of copyright can be made by the author of a work, the owner of the copyright in a work, an assignee of the copyright or a licensee of an interest in the copyright. The notification of copyright will be prima facie evidence of copyright and is useful when dealing with copyright infringement proceedings. Industrial designs right is an intangible right to the features of shape, configuration, pattern or ornament applied to an article by any industrial process or means, being features which in the finished article appeal to and are judged by the eye. Industrial designs law is governed by the Industrial Designs Act 1996 and Industrial Designs Regulations 1999 in Malaysia. However, industrial design does not include the method of construction of the device or features of shape or configuration of an article which are (1) dictated solely by the function which the article has to perform, or (2) dependent upon the appearance of another article of which the article is intended by the designer to form an integral part. An applicant may file an application to protect their rights with MyIPO. It must be highlighted that the applicant must file their industrial design first before they could disclose the same e.g by way of sale to the public failing which the design will not be considered as new. A registered industrial design is given an initial protection period of 5 years from the date of filing and is renewable for a further two consecutive terms of 5 years each. Patents are grants given to owners by the government which give the owner an exclusive right over the invention that they have created. Invention can cover product or processes. The protection also gives the owner the exclusive right to stop others from manufacturing, using and/or selling the owner’s invention in Malaysia without the owner’s consent or permission. For the invention to be patentable, it needs to be new, involves inventive steps and industrially applicable. A “minor invention” can also be as an utility innovation granted provided that it is new and industrially applicable. A patent and utility innovation can be protected by filing an application with MyIPO. A patent is protected twenty (20) years from the date of filing and a utility innovation is protected with an initial period of ten (10) years and is renewable for a two consecutive terms of five (5) years each. Malaysia has acceded to the Patent Cooperation Treaty thus the PCT international application can be filed at MyIPO where MyIPO is acting as the Receiving Office for the international filing of PCT application. A geographical indication helps to indicate the geographical origin of certain goods and possess unique qualities or characteristics that essentially represent the good’s place of origin. Basically, it points to the place where the goods or the characteristics of the goods are originated from. In Malaysia, “Sabah Tea’, ‘Tenom Coffee” and “Borneo Virgin Coconut Oil’ are registered geographical indication. Only producers carrying on their activity in the geographical area specified in the Register shall have the right to use a registered geographical indication in the course of trade. The right of use be in respect of the products specified in the Register in accordance to the qualify, reputation or characteristic specified in the Register. The current law in Malaysia that governs the protection of geographical indications can be found under Geographical Indications Regulations 2001. Applicant can register geographic indications with the MyIPO. However, if the geographic indications are not found in Malaysia, then an agent shall be appointed in Malaysia. A registered geographical indication is given ten (10) years of protection from the date of filling and is renewable for every ten (10) years. Confidential information in this context usually means any information that is kept private and is not disclosed to the public. For examples, any new product design, trade secrets, software, business information, marketing strategy and so on. There is no formal registration process for confidential information in Malaysia. It is possible to sue parties for breach of confidence. 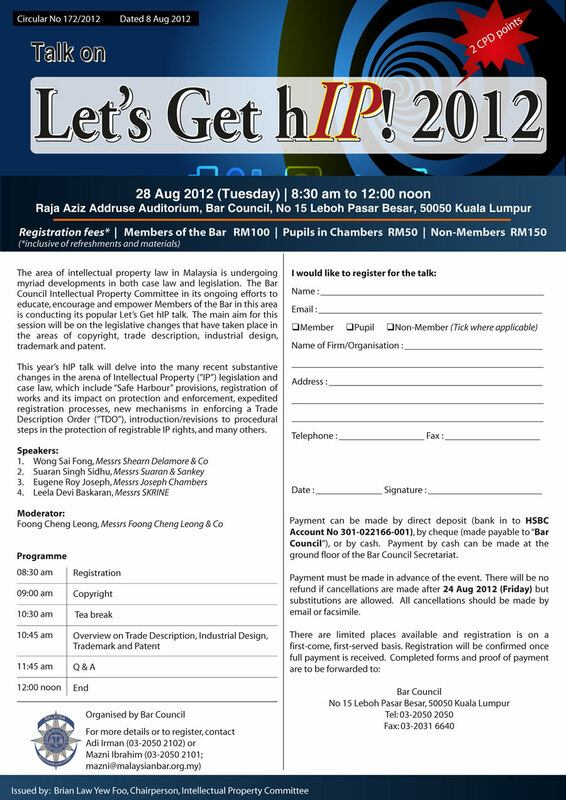 All businesses that wish to invest or trade in Malaysia should consider registered their rights in Malaysia. As Intellectual Property rights are generally territorial, one should take all steps to secure their rights before investing or trading. For example, if a foreign entity discovers that a local company is trading in the same trade mark as the former and earlier than the former in Malaysia, the former should consider using another trade mark or purchase the said trade mark from the latter provided that there is no element of misappropriation. The author would like to acknowledge Lim Chia Ann for her assistance in preparing this article.